small oval endocrine gland that lies at the base of the brain. It is sometimes called the master gland of the body because all the other endocrine glands depend on its secretions for stimulation (see endocrine system). ..... Click the link for more information. . The thyroid gland also produces the hormone calcitonin, which is involved in the regulation of serum calcium in the body. ..... Click the link for more information. in infancy and childhood. Treatment is by administration of the synthetic hormone levothyroxine. Excessive secretion of thyroxine, or hyperthyroidism, causes an increased metabolic rate, loss of weight despite good appetite, protrusion of the eyeballs, rapid pulse, and irritability. The condition, also known as Graves' disease, may be accompanied by enlargement of the thyroid. Hyperthyroidism may be treated through the use of medicines that block thryroxine production or the administration of radioactive iodine to kill thyroid cells. a specialized endocrine organ in vertebrate animals and man that manufactures and stores iodine-containing hormones that help regulate metabolism and the production of energy in the organism. Anatomy. The thyroid gland develops in embryos from the epithelium of the branchial (pharyngeal) pouches embedded in the pharyngeal floor as a result of the transformation of the hypo-branchial groove (endostyle) in lower chordates. The unpaired thyroid of cyclostomes is situated under the inferior wall of the gill part of the gut, while that of fishes is situated at the anterior margin of the branchial arteries (in bony fishes it includes the ventral aorta near the anterior gill arches, and in dipnoan fishes it is divided into two parts). The paired thyroid gland of amphibians is situated near the sublingual apparatus (behind the second arch in caudates and under the posterior cornua in tailless amphibians). The unpaired thyroid of reptiles, often divided into two lobes, is situated under the trachea. The paired thyroid of birds lies at the base of the bronchi. The thyroid of mammals consists of two lobes connected by the isthmus, but in some animals it is divided into two separate parts. In lower vertebrates, the last (fifth) pair of gill arches gives rise to the ultimobranchial bodies (seeULTIMOBRANCHIAL BODIES), which secrete the hormone thyrocalcitonin (seeTHYROCALCITONIN). In mammals, this tissue is represented by the C cells of the thyroid. In man, the gland is completely formed by the eighth or ninth month of development of the fetus. It consists of two lateral lobes and a transverse isthmus, connecting the lobes near the lower ends. Sometimes a third lobe, the pyramid, arises from the upper part of the isthmus. 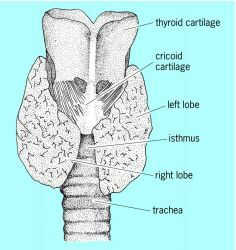 The thyroid gland is situated in the neck, in front of the trachea and on the side walls of the larynx next to the thyroid cartilage (hence the name of the gland). The lateral lobes abut the walls of the pharynx and esophagus in back. The external, or superficial, surface of the thyroid is convex, while the internal, or deep, surface, facing the trachea and larynx, is concave. The gland is about 50–60 mm in diameter; at the isthmus, it is 6–8 mm in diameter. It weighs 15–30 g (somewhat more in women). It is abundantly supplied with blood vessels, including the inferior and superior thyroid arteries. The superior cervical and stellate sympathetic ganglia provide sympathetic innervation, while branches of the vagus nerve provide parasympathetic innervation. The main structural and functional units of the thyroid gland are the thyroid follicles (spherical or of irregular geometric shape) filled with a colloid substance having an iodine-containing protein, thyroglobulin (seeTHYROGLOBULIN). The follicles are very close to one another. Their walls are lined with a single layer of glandular epithelium. The structure of the gland also includes connective-tissue stroma, which are adjacent to the follicular wall and consist of collagenous and elastic fibers interspersed with blood vessels and nerves. The shape, volume, and height of the follicular epithelial cells vary with the functional condition of the gland: the epithelium is normally cuboidal, high and columnar (or cylindrical) when very active, and flat when inactive. The size of Golgi’s complex and the number of mitochondria and secretory drops contained in the thyroid cells increases when secretion is active. The number and length of the microvilli arranged on the apical surface of the epithelium and facing the follicular cavity also increase when the gland is very active. The density, size, number, and location of the cytoplasmic (or albuminous) granules characterize both the process of biosynthesis and the secretion of specific products. Physiology. Such basic biological processes as growth, development, and tissue differentiation depend on the normal functioning of the thyroid gland, which secretes two hormones— thyroxine and triiodothyronine (seeTHYROXINE and TRIIODOTHYRONINE). The biological effects of normal levels of the thyroid hormones are reflected in the maintenance of the organism’s energy and biosynthesis processes at an optimal level. The action of the hormones on the process of biosynthesis and, consequently, on the body’s growth and development, is mediated by the regulation of tissue respiration. Excessive amounts of the hormones intensify all types of metabolism, with catabolic processes, expenditure of substances and energy in the form of heat, and products of incomplete and incorrect metabolism predominating. The mode of action of the thyroid hormones entails stages of “recognition” and perception of cell signals and generalization of the molecular processes responsible for the nature of the response. Specific protein receptors in the cells of the various tissues “recognize” a hormone and trigger a biochemical reaction. The growth-stimulating action of the thyroid hormones, associated with the intensification of protein biosynthesis, is realized through the formation in the nuclei of the cells of the hormone-receptor complex that activates the synthesis of messenger RNA and the subsequent stages in the synthesis of structural proteins and protein enzymes. Thyroid function is regulated by the central nervous system. When external and internal factors are constantly changing, the cerebral cortex plays the major role in regulating the hypothalamus-hypophysis-thyroid system. The thyroid also interacts with other endocrine glands. The hypophysis is an important factor in the regulation of thyroid activity; it produces thyrotropin (seeTHYROTROPIN), which stimulates the development and functioning of the thyroid gland (seeNEUROSECRETION). Thyroid diseases in man. Thyroid diseases—inflammations (seeTHYROIDITIS), tumors, injuries, and congenital anomalies—may cause the thyroid to enlarge (seeGOITER) and function pathologically. They may also lower the production of hormones (hypothyroidism to the point where myxedema develops) or increase them (seeGOITER, DIFFUSE TOXIC; HYPOTHYROIDISM; and MYXEDEMA). Mnogotomnoe rukovodstvo po vnutrennim bolezniam, vol. 7. Bolezni endokrinnoi sistemy. Leningrad, 1966. Mekhanizm deistviia gormonov. Tashkent, 1976. Grollman, A. Clinical Endocrinology and Its Physiologic Basis. London, 1964. Williams, R. H. Textbook of Endocrinology, 4th ed. Philadelphia-London, 1968. Negoescu, J., A. Constantinescu, and C. Heltianu. Biochimia hormonilor tiroidieni. Bucharest, 1971. An endocrine gland found in all vertebrates that produces, stores, and secretes the thyroid hormones. People with an underactive thyroid gland produce insufficient amounts of the hormones required for optimal body functioning. On the functions of thyroid gland, she said that an excess or reduced secretion of thyroxine affected health. Thyroid cancer is a disease that one gets when abnormal cells begin to grow in his or her thyroid gland camera, she explained and maintained that thyroid cancer was an uncommon type of cancer. With Hashimoto's, your body produces antibodies that attack and destroy the thyroid gland. What Is Hypothyroidism And How Common Is It In US? Afterwards, the medical cadre approached the thyroid gland and removed the tumour by the endoscope. TSH is a hormone produced by the anterior pituitary gland that stimulates the thyroid gland to synthesize and secrete thyroid hormones T4 and T3. When hormone production in the thyroid gland rises, the feedback effect causes the pituitary gland to produce less TSH and the situation returns to normal. Metastatic disease of the thyroid gland is uncommon, occurring in 1. Intraoperatively, lipomatous tumour-like material was observed replacing the thyroid gland tissue. Browse the Thyroid Gland Disorders Treatment Market - Global Thyroid Gland Disorder Types Analysis and Forecast 2013-2020 at http://www. To study the morphometric features of the thyroid lobes and isthmus of the thyroid gland. We may not pay much attention to the condition of our thyroid gland but it is imperative to note that thyroid cancer is now the fastest growing cancer in the country.